Did it make anything better? Of course not. Pirates ended up losing 8-0, with half the crowd leaving in the seventh inning (excuse me, but that's seriously lame, Pittsburgh). And to much a smaller and less disappointing extent, those pistachios, although tasty, weren't Trader Joe's Salt and Pepper Pistachios. These TJ pistachios are awesome. Although I must warn you right out front: you must really, really, really like-a ze pepper to stand a shot of being able to ingest these. It's not a light little sprinkle of some table variety pepper; it's more like this kinda thing being pushed on your taste buds. The first couple nuts I had, I thought I just picked a particularly strong few by chance - nope. 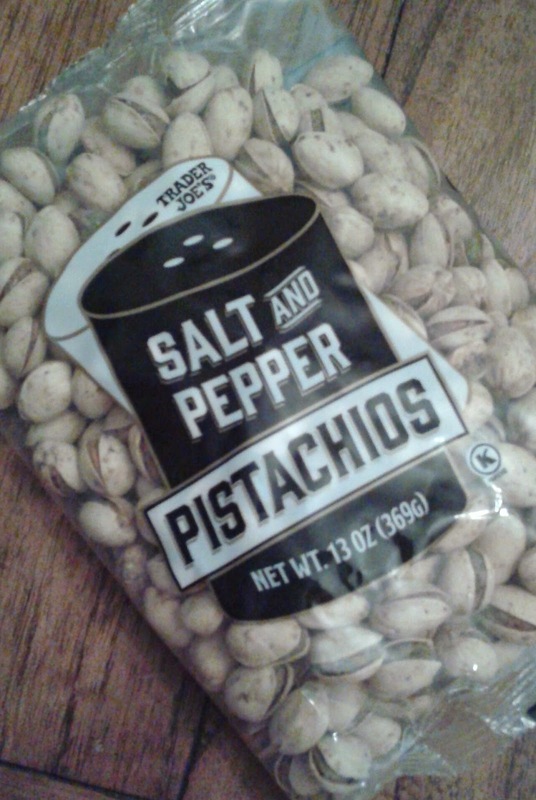 Each pistachio is handily sea salted and black-and-red-peppered with a powerful spicy dose that will clear sinuses and knock out the unsuspecting. Heartburn warning. Yet, despite the potent spice, the taste of the pistachio still shines through in all its natural nutty glory. Gotta pick a small quibble, though. The 13 ounce bag cost $7.49, which if my math is right (we've never really hit it off) equates to a little over $9.20 a pound. The aforementioned convenience store pickups I wolfed down? Four bucks for the half a pound (so $8 for a full pounder). Granted, the TJ's were better, but if you'd assume a more reasonable price at a historically inexpensive grocery chain versus the gas station mark up, you'd be wrong here. Pepper isn't that pricey...is it? Seems like other TJ nut prices have gone up - don't think I didn't notice that extra buck this past time, cashew butter. "These get kinda intense," Sandy said as we both munched a couple handfuls down, noting how they made her tongue burn. "It's not exactly what I think of when I think about pepper - it's just really, really strong." Ah, but it's a burn so good, I say. She's going with a three, while I'm going for just a notch below perfection. Hatch Valley Salsa - now that sounds awesome! will be on the look out - always love a good salsa verde. Love these nuts, good low calorie fiber for a nut and quite tasty. I also second the Hatch salsa. Really tasty, makes me pine for Albuquerque where they douse everything in hatch chiles. Used this and the TJ garlic-coffee rub to marinate a ribeye yesterday and it was delicious!